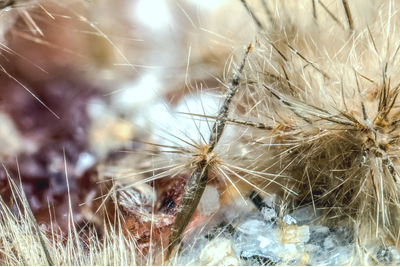 At the same specimen, in addition to these hair-like crystals, it is also this curious combination spindle-shaped. In the background the pink crystal of villaumite, out of focus. Collection and photo of Gianfranco Ciccolini. Nikon D610, bellows, Schneider Kreuznach 28mm; f:4. Focal using 5.6.